Long awaited decals depicting the Meteorites Aerobatic Team are now available. 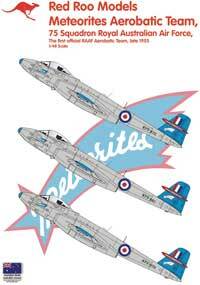 The Meteorites Aerobatic Team was formed by 75 Squadron during the 1950s, with pilot’s drawn from the Squadron. The team was the RAAF’s first official aerobatic team and flew the Meteor F Mk8. The aircraft featured the striking medium blue fin and rudder, along with blue and red detail on the nose and wingtips. The team’s emblem was carried on the nose of each aircraft. The decal sheet depicts all five Meteor F Mk8 aircraft allocated to the team, and for the first time the names of all the pilots are included on the sheet. The sheet comprises decals for all five aircraft and a detailed, highly illustrated instruction sheet, complete with details for accurately mixing and matching the medium blue fin colour.